The iEvac is the only Smoke/Fire Hood certified to the American National Standard and Certified to NIOSH 42 CFR 84. In addition, the U.S. Department of Homeland Security has Designated the iEvac as a Qualified Anti-Terrorism Technology. It protects against fire-related gases including carbon monoxide, hydrogen cyanide, smoke, & hydrogen sulfide. The iEvac contains a HEPA filter that removes more than 99.97% of sub-micron particles such as ebola, anthrax, smallpox, and radioactive particles. One universal size can be put on in under 30 seconds. The hood features easy-to-breathe dual filters and is compact, lightweight, and vacuum sealed in a foil bag for a long shelf life. Its unobstructed field of view can be used with eyeglasses, beards, and long hair. Please note that a smoke/fire hood has been referred to by many different names. 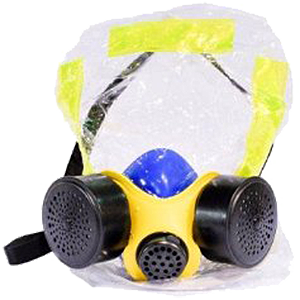 Some examples are smoke mask, smoke hood, escape hood, escape mask, fire escape hood, smoke escape hood, escape smoke hood, emergency escape hood, emergency escape mask, CBRN hood, carbon monoxide filter, evacuation hood, carbon monoxide hood, carbon monoxide mask, evacuation mask, gas mask for smoke, escape respirator & emergency mask. Whatever you might want to call it, the iEvac gives unparalleled protection! Please review all the details on the web site.